It's with great pride I today introduce the Eye Tribe Tracker. It's the worlds smallest remote tracker, the first to use USB3.0 and the only one below $100. It's not targeting the research community, instead it aims for new grounds being developers of next-gen gaze interaction applications. I will let the academic crowd determine if it meets their requirements. I'm too biased to claim that it's better than this or that. The only way to properly evaluate eye trackers is through standardized evaluation carried out by independent parties. On a personal level today marks an important milestone. I built my first gaze interaction software back in 2008, titled Neovisus, as the outcome of my MSc. at Lund University. During this work I realized that gaze interaction could be a natural interaction element, not just for a specific user group but for everyone. At the time eye trackers were unfortunately really hard to come by, the one I used costs $25,000 (and still does). Javier San Agustin and myself attempted to fix this during our R&D of the ITU GazeTracker, an open source eye tracker software. In many ways we succeeded, but it lacked critical features; you had to order components to assembly your own rig, it was difficult to setup and tracking was far from robust compared to commercial alternatives. Overall, the ITU GazeTracker was a great learning experience, it evolved to become most distributed open source eye tracking software and gathered an active community. At the same time, we learned what it would take to build something great. It would require us to focus and make a full time commitment. Here we are two years later. With the launch of an truly affordable eye tracker we have taken a big step towards realizing the vision we are burning for. No longer is there a prohibiting barrier preventing developers from exploring the many benefits eye tracking can bring to their applications. Best of all, this is still the beginning. I can't wait to get this into the hands of all the developers who placed a $99 bet on the future. 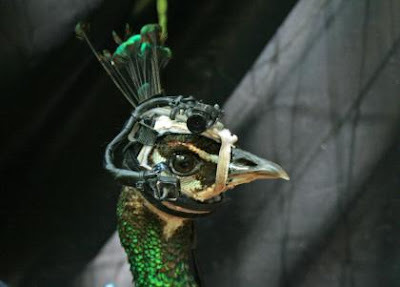 Through their eyes: selective attention in peahens during courtship," Jessica Yorzinski, Gail Patricelli, Jason Babcock, John Pearson, Michael Platt. Journal of Experimental Biology, July 24, 2013. From the IT University of Copenhagen (GazeGroup and EyeInfo) comes an offer for two fully funded PhD positions on the topic of eye tracking for mobile devices. This is an excellent opportunity to work together with domain expertise on the development of the next generation eye tracking systems. The aims of the project are to develop eye tracking algorithms and hardware for mobile devices, applying eye movement signals to games, toys, device interaction, augmented reality, and combining these signals with existing sensors in mobile devices, like GPS, gyroscope, accelerometer, and/or brain activity measured by EEG electroencephalography. 1) Development and test of new robust eye tracking and gaze estimation algorithms and optimization of eye tracking algorithms for low power consumption. 2) Exploration of novel ways of applying gaze interaction on smartphones, tablets and smartglasses. The project requires a willingness to cooperate closely with the industrial partners involved in this project, i.e. The Eye Tribe, LEGO System A/S and Serious Games Interactive. The ideal candidate will have a strong background in both computer science (especially within computer vision) AND in interaction design (with an experimental approach) OR excellent competence in at least one of them. 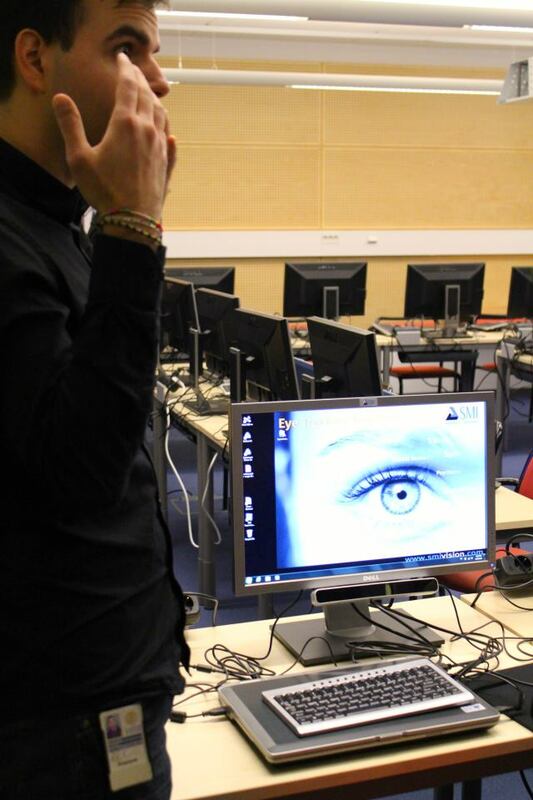 Lund University HumLab eye tracking equipped classroom/lab. What's better than an eye tracker in a lab? A room full of them! 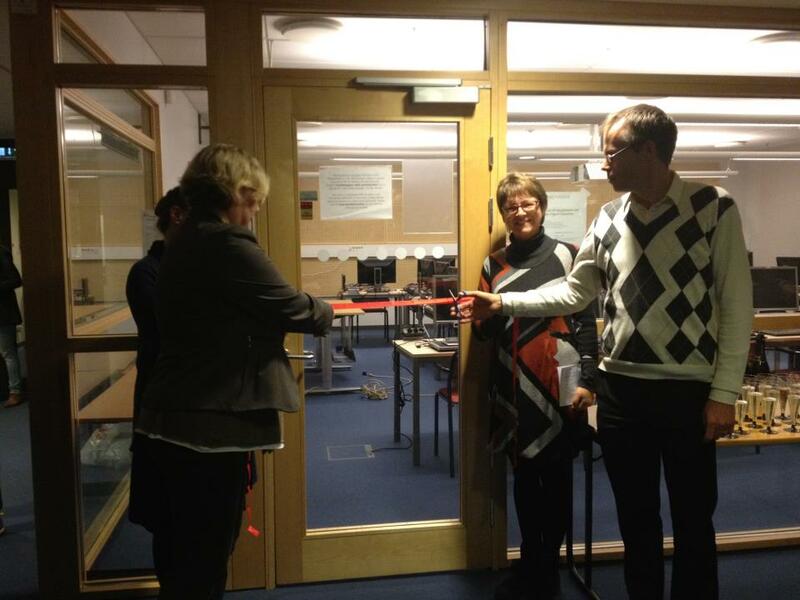 On Thursday the new eye tracking lab at Lund University HumLab was opened. It's housed in the basement of the Center of Language and Linguistics, close to the existing eye tracking lab where I did my Masters thesis on gaze interaction in 2008. 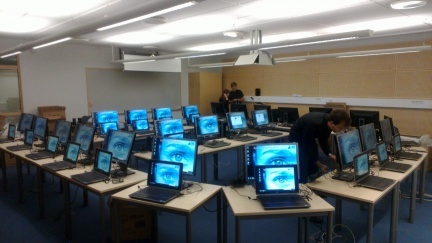 The new lab is termed "the digital classroom" and features 25 eye tracking equipped computers for large studies on electronic media and education. During the last ten years the HumLab group have pursued research on the education processes, how students read educational material and how their reading style evolves during university studies. The digital classroom contains eye trackers from German manufacturer SMI (RED-M) and is co-financed by the Wallenberg foundation and Lund University for a total investment of 2.2 million SEK (US$328k). In January a new project starts that aims at improving learning in elementary and high school. Big congrats to Kenneth Holmqvist and the team. Very exciting to see the output of this! By the way, I'm in the process of reading a book by the same group titled "Eye Tracking: A comprehensive guide to methods and measures". It is, by far, the most accurate, comprehensive and well-written publication on eye tracking and associated research to this date. A must-read for any serious researcher and/or developer. From Alexandre Alapetite and John Paulin Hansen, who I previously did an eye controlled robot with, comes a demo that shows gaze control of a drone. The user´s gaze is determined by an eye tracking apparatus (Alea technology) situated below the display. The drone will fly in the direction that people are looking. The operator is located near the drone. However, he could be situated anywhere, even hundreds of miles away. Gaze Controlled Flying was presented as an interactive demo at the NordiChi 2012 conference, October 16, IT University of Copenhagen, Denmark. Cool guys! Next year’s conference will include four panel discussions, 9 keynote speakers and a large number of sessions of 4 to 6 talks. We also include pre-conference methods workshops taught by top experts in the field on diverse topics related to eye movements and eye tracking, open to all researchers at every level, and to members of industry, running from the 7th to 10th August. You can see a list of these topics and the teachers here: http://ecem2013.eye-movements.org/workshops. Oct 15, 2012: Submission of proposals and abstracts will open. Jan 15, 2013: Deadline for proposals for symposia. Feb 25, 2013: Notification on acceptance for symposia. March 1, 2013: Deadline for 2-page extended abstract for talks and 200 word abstracts for posters. April 1, 2013: Registration opens. April 15, 2013: Notification on acceptance for talks and posters. May 1, 2013: Last day for reduced registration fee. Today the first public demonstrations of the Fujitsu/Docomo/Tobii tablet came online, all from the CEATEC 2012 expo in Japan. 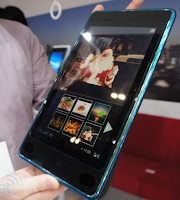 The prototype tablet, called iBeam, is designed by Fujitsu for Docomo and contains an eye tracking module from Swedish Tobii, namely the IS-20 which was introduced earlier this year. 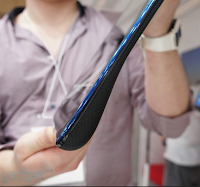 The form factor appears a bit on the large size with a bump towards the edge where the eye tracking module is placed, sort of looks like a tablet inside another case. On the software side the tablet is running Android where a gaze marker is overlaid on the interface. Selection is performed using simple dwell activation which is known for being both stressful and error-prone. The sample apps contains the usual suspects, panning of photos and maps, scrolling browser and image viewer. Pretty neat for a prototype. Fujitsu also demonstrated a LCD monitor with an eye tracking camera system embedded while the actual gaze estimation algorithms are running on an embedded Windows computer. This display is not using the Tobii IS20 but a system developed by Fujitsu themselves which is stated to be low-cost. Question is why they didn't use this for the tablet. From what I can tell it does not provide the same level of accuracy, it appears to be a rough up/down, left/right type of gaze estimation which explains why the demo apps only handles panning of maps and images.